Convenient foam in a ready to use formula, the foam application allows you to see where you have sprayed. Waterproof in ten minutes after application. Kills weeds and Johnson Grass down to the root. Reduces drift to desired plants and grasses. 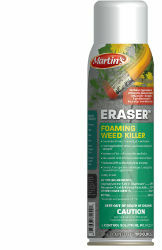 Contact foam product allows you to apply directly to weeds in tough places. Eraser™ Foaming Weed Killer contains glyphosate and pelargonic acid and related fatty acids; the same ingredients found in Roundup Sure Shot Foam.